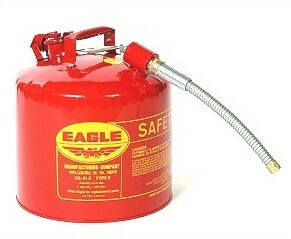 PRODUCT: EAGLE 5 GALLON TYPE-2, RED STEEL, GAS SAFETY CAN WITH 7/8" FLEXIBLE METAL SPOUT. PRICE/EACH. * Eagle Type II Safety Gas Cans have the same quality features as Eagle’s Type I gas cans and have an additional opening. The pressure relief, spring-closing lid opening is used for filling. * Eagle Type II safety gas can actuated pour valve opening with flexible metal spout is used for safely dispensing flammable liquids. * Eagle's Type II Safety Gas Can - Both openings are equipped with a non-sparking brass spout and flame arrestor designed for flash-back protection. * Flexible steel spout Spout / funnel. * Eagle Type II Safety Gas Can Meets OSHA29 CFR1910. 106, CFR1925.152 and NFPA Code 30. FM, UL and ULC approved. * Heavy-duty steel design and rugged construction is safe for industrial storage and transport of flammables. * Double mesh flash arrester. * RED high-gloss, solvent resistant, baked on enamel finish, the proper color for gasoline applications.